Over the weekend I finished The Wedding Girl (1999) by Madeleine Wickham, a UK author who also goes by her pen name Sophie Kinsella. She’s most famous for her Shopaholic series, which I haven’t read yet (although I’ve seen the adorable movie “Confessions of a Shopaholic” starring Isla Fisher and Hugh Dancy). However, I’ve read and loved all of Kinsella’s stand-alone novels: Can You Keep a Secret? (2005), The Undomestic Goddess (2006), Remember Me? (2008), and Twenties Girl (2009). Needless to say, I wasn’t worried that I wouldn’t enjoy Wickham’s older work. The Wedding Girl is about Milly Havill, who married an American gay man at 18 so he could stay in the UK, but now a decade later, she’s about to marry her fiance Simon Pinnacle–The wedding’s days away, and she hasn’t gotten divorced yet! Of course, chaos explodes when her secret finally gets out, but the question remains: who spilled the beans? This is a hilarious story with many serious moments. Wickham addresses issues like homosexuality, unplanned pregnancy, and death with poise and tact, so the reader never feels the writing is polarized. The subplots of Milly’s gay friends and her sister’s secret pregnancy are just as interesting as all the wedding drama, and all the characters are equally frustrating and endearing in their own way. Many readers prefer Wickham’s alter-ego Kinsella, and I agree, but only because I believe that she’s improved her writing over time. Fortunately for her, her success has allowed her to re-release her older novels, including her very first novel The Tennis Party, which will be released again in the US on August 30 under the title 40 Love. The Wedding Girl is definitely a character novel with little actual moving action, but it’s a good read nonetheless. I would recommend Kinsella’s stand-alone novels with more enthusiasm. I always look forward to her books! 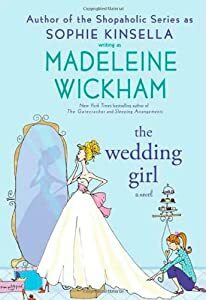 This entry was posted in Book Review and tagged books, Confessions of a Shopaholic, Madeleine Wickham, Sophie Kinsella, Wedding Girl by Book Club Babe. Bookmark the permalink.